Original Editors - Bilitis Crokaert as part of the Vrije Universiteit Brussel Project. An acetabular labral tear can cause pain if the labrum is torn, frayed, or damaged. Labral tears cause groin pain or pain in the anterior side of the hip, and less commonly buttock pain. This mechanically induced pathology is thought to result from excessive forces at the hip joint. For example, a tear could decrease the acetabular contact area and increase stress, which would result in articular damage, and destabilize the hip joint. Anterior labral tears - the pain will generally be more consistent and is situated on the anterior hip (anterosuperior quadrant) or at the groin. They frequently occur in individuals in European countries and the United States. Posterior labral tears - are situated in the lateral region or deep in the posterior buttocks. They occur less frequently in individuals in European countries and the United States, but are more common in individuals from Japan. 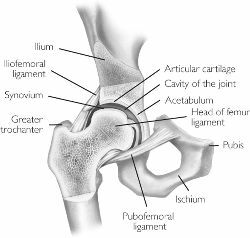 The acetabular labrum is a fibro-cartilaginous rim, which encompasses the circumference of the acetabulum. It helps to keep the head of the femur inside the acetabulum, and varies greatly in form and thickness. Basal surface - attached to the acetabular bone and ligaments. On the anterior aspect, the labrum is triangular in the radial section. On the posterior aspect, the labrum is dimensionally square but with a rounded distal surface. The condition is not age related. The reported age of people with hip pain and a labral tear spans from 8 to 75 years old. Symptoms - A constant dull pain with periods of sharp pain that worsens during activity. Walking, pivoting, prolonged sitting and impact activities aggravate symptoms. Some patients describe night time pain. The symptoms can have a long duration, with an average of greater than two years. Mechanical Symptoms - A variety of mechanical symptoms have been reported, including clicking (most frequently),locking or catching, or giving away. The significance of these signs is questionable. Includes relative rest, anti-inflammatory medications, and pain medications if necessary. Combined with a 10-12 week intensive physiotherapy program. The patient's pain may lessen during this period but it is possible that the pain will return once the patient returns to his normal activities. When conservative management is unable to control the patient’s symptoms, surgical intervention may be considered. The test is considered positive if one or more of these symptoms are reproduced during the test: click, clunk, or pain in the groin region. Impingement test - The hip joint is passively flexed to 90°, internally rotated, and adducted (see video below). McCarthy sign/Thomas Test (hip flexion to extension manoeuvre) - With the patient in a supine position, the subject fully flexes both hips. The examiner slowly/passively extends the subject’s lower extremities and moves the hips into external rotation. The test is repeated, but with the hip in internal rotation. Internal rotation load/grind test - With the patient in a supine position, the examiner passively flexes the patient's hip to 100°, and then rotates the subject’s hip from internal rotation to external rotation while pushing along the axis of the femur through the knee to elicit ‘grind’ (see video below). Fitzgerald Test - For assessment of the anterior labrum. The patient's hip is acutely flexed and then extended while internally rotated and in full abduction. Patrick test - For assessment of the posterior labrum. The patient's hip is flexed and then extended while in abduction and external rotation. MRA (magnetic resonance arthography) - Produces the best result, as the intra-articular or systemic infusion of gadolinium is required to obtain the detail necessary to study the labrum. The principle of the procedure relies upon capsular distension. The outline the labrum with contrast and filling any tears that may be present. MRA has limitations regarding the sensivity for diagnose acetabular labral and articular cartilage abnormalities, it has also been proven that MRA may be less effective in identifying posterior and lateral tears. Diagnostic-image-guided intra-articular hip injections - Can also be helpful in the diagnosis of labral tears. Hip arthroscopy - Used as a diagnostic gold standard for ALT and is used as therapeutic medium. Springer BA, et al. Acetabular labral tears: diagnostic accuracy of clinical examination by a physical therapist, orthopaedic surgeon, and orthopaedic residents. N Am J Sports Phys Ther. 2009 Feb;4(1):38-45. http://www.ncbi.nlm.nih.gov/pmc/articles/PMC2953315/pdf/najspt-04-038.pdf (accessed 27 January 2014). Nishii T, et al. Acetabular labral tears: contrast-enhanced MR imaging under continuous leg traction. Skeletal Radiol. 1996 May;25(4):349-56. ↑ 1.0 1.1 1.2 Groh MM, Herrera J. A comprehensive review of labral tears. Curr Rev Musculoskelet Med 2009 Jun;2(2):105-17. ↑ 2.0 2.1 Lewis CL, Sahrmann SA. Acetabular Labral Tears. Phys Ther 2006;86:110-121. ↑ 3.0 3.1 3.2 McCarthy JC, Noble PC, Schuck MR, et al. The Otto E. Aufranc Award: the role of labral lesions to development of early degenerative hip disease. Clin Orthop 2001;393:25–37. ↑ 5.0 5.1 5.2 Byrd JW. Labral lesions: an elusive source of hip pain case reports and literature review. Arthroscopy 1996;12:603–612. ↑ 7.0 7.1 Hase T, Ueo T. Acetabularlabral tear: arthroscopic diagnosis and treatment. Arthroscopy 1999;15:138 –141. ↑ 8.0 8.1 Klaue K, Durnin CW, Ganz R. The acetabular rim syndrome: a clinical presentation of dysplasia of the hip. J Bone Joint Surg Br 1991;73:423– 429. ↑ 9.0 9.1 Narvani AA, Tsiridis E, Tai CC, Thomas P. Acetabular labrum and its tears. Br J Sports Med 2003;37:207-211. ↑ Dorrell JH, Catterall A. A torn acetabular labrum. J Bone Joint Surg 1986;68:400-3. ↑ Fitzgerald RH. Acetabular labrum tears. Diagnosis and treatment. Clin Orthop Relat Res 1995 Feb;(311):60-8. ↑ Schmerl M, Pollard H, Hoskins W. Labral injuiries of the hip: a review of diagnosis and management. J Manipulative Physiol Ther 2005 Oct;28(8):632. ↑ 18.0 18.1 Troelsen A, Mechlenburg I, Gelineck J, Bolvig L, Jacobsen S, Søballe K. What is the role of clinical tests and ultrasound in acetabular labral tear diagnostics? Acta Orthop 2009 Jun;80(3):314-8. ↑ Springer BA, Gill NW, Freedman BA, Ross AE, Javernick MA, Murphy KP. Acetabular labral tears: diagnostic accuracy of clinical examination by a physical therapist, orthopaedic surgeon and orthopaedic residents. N Am J Sports Phys Ther 2009;4(1):38-45.